A video clip played before the commission of inquiry into allegations of state capture on Thursday morning has laid bare how stacks of cash used for "bribes" were moved around at Bosasa headquarters. 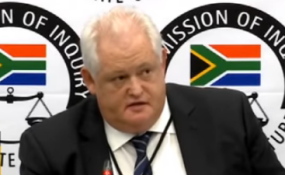 In the video clip, which was apparently taken in 2017, and submitted by former Bosasa top boss Angelo Agrizzi as evidence to the commission - former Bosasa CFO Andries van Tonder is seen taking a box allegedly filled with money from one vault to another. The box is taken from a secretary's vault and moved to Bosasa CEO Gavin Watson's vault. The video then shows Watson seated at his desk, and next to him is Bosasa's Joe Gumede. Bosasa spokesperson Papa Leshabane also appears in the video and appears to be on his cellphone. Watson appears sitting in his vault, counting and dispensing cash. Agrizzi also said that, in the video, Gumede is speaking with Watson in English and Leshabane is on his cellphone, speaking either Xhosa or Tswana. Agrizzi mentioned Gumede in his first day of testimony on Wednesday. He said, after Bosasa was awarded a contract by Airports Company South Africa (ACSA) for handling the multi-storey parkade at OR Tambo International Airport, he often accompanied Gumede, who was a director at Bosasa, on official business. Agrizzi added that, during these visits, they had met with other individuals from ACSA and that Gumede would hand them grey security bags that allegedly contained money. Asked if the money was not always visible, Agrizzi said the "way it was packed, you could see it was cash". He said he later started arranging payments, which confirmed earlier suspicions that the ACSA officials were getting cash. "I had also received one of those bags [on a monthly basis] I knew what was in those bags," he said. During his testimony on Thursday, inquiry chairperson Deputy Chief Justice Raymond Zondo asked: "During your time at Bosasa, you have never seen these bags carrying anything other than cash?" "I can confirm," Agrizzi replied. Agrizzi also told the commission that cash was "nothing at the company" and that it was "readily available". Watson used to call the cash "Monopoly money", Agrizzi said. He quoted Watson as saying: "It's just money so we can get Monopoly". Agrizzi also told the commission: "My hands are pretty bruised from all the years of closing the drop safe."